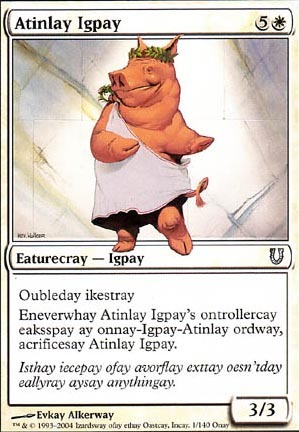 Oubleday nitiativeiay Ày haquecay oisfay ueqay elay ontrôleurcay uday Ochoncay atinlay rononcepay nuay otmay onnay-Ochoncay-atinlay, acrifiezsay elay Ochoncay atinlay. Oubleday ikestray Eneverwhay Atinlay Igpay's ontrollercay eaksspay ay onnay-Igpay-Atinlay ordway, acrificesay Atinlay Igpay. Isthay iecepay ofay avorflay exttay oesn'tday eallyray aysay anythingay.